I am too late, to attend the function. Joe went to the coaching class too, to find her sister. She is too confident, that she will be able to clear Civil Services Examination this time. In the first sentence, too is used to express ‘very’, while to indicates direction. In the next sentence, to has been used to refer ‘place’, while too is used as ‘also’. Lastly, too is used to refer to ‘highly’, whereas to is used to indicate ‘goal’. Meaning 'To' is used in sentences to indicate motion in a specific direction. 'Too' refers to a greater extent, than what is required. Example I have to wake up early in the morning. This is too old fashioned. Last Saturday, we have been to Mumbai. She is not only beautiful, but intelligent too. Could you please mail the documents to me? Before returning from Jaipur, they visited Nahargarh fort and Jaigarh fort too. We went to Agra, last month. To highlight the recipient of something or the one who experiences something. Siddharth told that to Priya and she giggled. Don’t be so embarrassed, it can happen to anyone. Train accident toll has risen to 10. They were really nice to me. She likes to play badminton. Her brother is married to his best friend. That green book on the table belongs to me. Arun wants to go home. I’d love to come there. Ananya told me to return the book to Daniel. Can you tell me what to do next? To meet her mom, she went all the way to London. We are sorry to inform you that, your project is not selected. The dress is too short. Your hairs are too oily. I don’t like people who talk unnecessarily and that too very loudly. Don’t forget to bring the clothes and perfume too. The numerical is too difficult. ‘To’ implies ‘directed towards’, which can be used in sentences for indicating motion in a specific direction. Conversely, ‘Too’ means high in degree or quantity, than required or desired. While ‘to’ is a preposition which is used to show the relation between the subject with the element in the clause. As against, ‘too’ is an adverb, that is applied in sentences to modify the meaning of verb or adjective and express a degree of something. The word ‘to’ is often followed by a noun and a verb. As against, too is used before an adjective or an adverb. I don’t want to join the class. He gifted the pen to Monica. Sonia works from 8 AM to 9 PM. She had too many cookies in the evening. You can join us too. 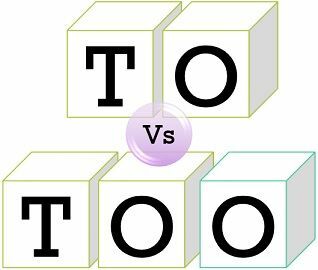 The best way to remember the difference between to and too is that while to has only one ‘o’ too has more than one ‘o’, i.e. many ‘o’s’. So, you can use too wherever you want to indicate more than enough, in excess, also, very etc., otherwise, you can use to. informative, in that,, .. words & terms that are either misused, & or not understood, ..are clearly & simply set out with clarification………. I am not a scholar, however, I am interested in the correct usage & the meaning of specific words & terminology. Thanks for the information.